AlphaNinja - Clorox(CLX) was mentioned positively in Barrons back on May 4th. The magazine suggested that gains were in store thanks to the pricing power of Clorox's brands. In addition, cost cutting and easing commodity prices would boost margins in the years to come. Yesterday, Clorox announced a 9% increase in it's dividend, which now yields about 3.4% -> very nice. That $4.15 equates to a forward PE of 13.5 -> I would not expect to see this high-quality stock trade at a lower multiple, pushing it's dividend yield above 4%. As a general rule of thumb, companies that have a dividend yield of 3% and higher should by nature have a Free Cash Flow yield well above that, making the dividend yield a great indicator for us FCF-chasers. -- EBIT (earnings before interest and taxes) margin growth increased to 75-100 basis points from the previously communicated range of 50-75 basis points, due to anticipated continuing strong cost savings and a more moderate commodity cost environment. Here's what I see as the company's possible market valuation. 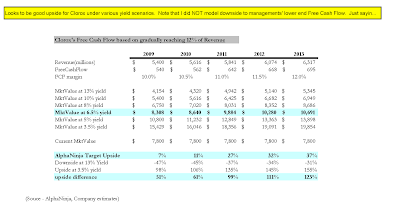 Looks cheap to me, based on Free Cash Flow Yield(FCFY).